Fossils from giant, ice age-beasts were uncovered while workers were digging an extension to the Los Angeles subway system. 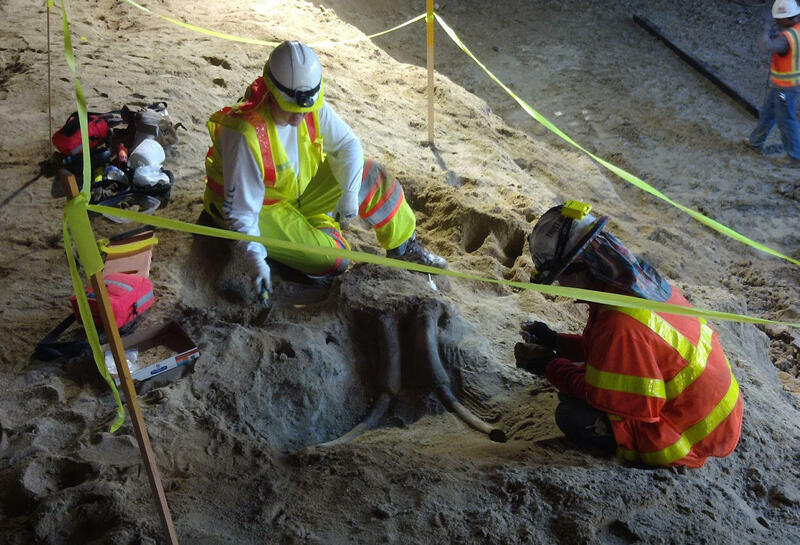 The finds include a 3-foot-long section of mammoth tusk, as well as a skull and partial tusks from a much younger animal, which might have been either a mammoth or a mastodon, according to The Source, a transportation blog about the L.A. Metro. Over the eons, this constant ooze of asphalt has created sticky pits in valleys that would often become obscured by leaves, branches and other ground cover. As a result, unwary animals stepped into the sticky death traps. The viscous ooze trapped small animals and insects immediately, while larger beasts like mammoths sank inches into the tar, struggling to get out before becoming stuck, researchers have noted. The dead or dying animals attracted predators as well -- some of which also became stuck in the asphalt. All told, more than 1 million fossils have been found in the tar pits, according to the La Brea Tar Pits & Museum. Mammoths and mastodons are both Proboscideans. Though both were majestically large and had shaggy coats and impressively curved tusks, mammoths are much more closely related to modern-day elephants, having arisen about 5 million years ago in Africa. By contrast, mastodons arose about 27 million to 30 million years ago. Because of the subway line project’s proximity to the La Brea Tar Pits, Metro officials were anticipating fossil finds and brought on paleontologists from the firm Cogstone to make sure that any discovery of prehistoric fossils would be safely excavated and preserved, according to the blog post. The new finds were immediately covered with plaster for preservation and sent to the nearby Natural History Museum of Los Angeles County.